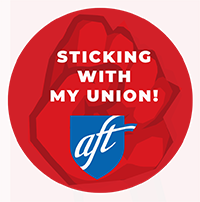 AFTNJ is a federation of education workers from the former NJ State Federation of Teachers’ locals with AFT Rutgers and The College Council. The Council of New Jersey State College Locals, AFT, AFL-CIO is comprised of 11 Locals and represents faculty, adjunct faculty, librarians and professional staff at the following institutions of higher education: The College of New Jersey, Kean University, Montclair State University, New Jersey City University and the A. Harry Moore School, Ramapo College of New Jersey, Richard Stockton College, Rowan University, Thomas Edison State College and William Paterson University. 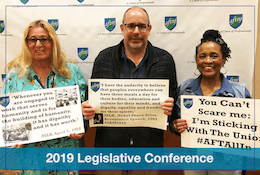 AFT Rutgers is the umbrella organization for all AFT affiliates at Rutgers University. Currently three locals comprise AFT Rutgers. The Part Time Lecturer Faculty Council, which represents part time lecturers. The Union of Rutgers Administrators-American Federation of Teachers (URA-AFT), Local 1766 represents more than 2,400 staff positions at Rutgers with more than 350 individual job titles.